The fourth season of Orange Is The New Black debuted on Netflix in June 2016. Featuring the exploits of Piper Chapman (Taylor Schilling) and fellow inmates at the fictional Litchfield Penitentiary, the thirteen episodes dealt with a new intake of both prisoners and guards. It's somewhat unfortunate that the creator of the series came up with the only weak episode of such a strong new season. 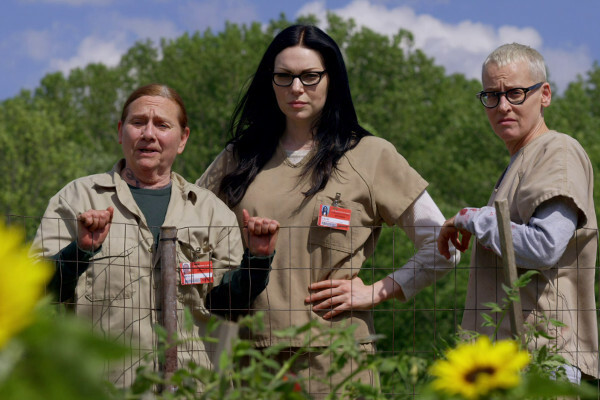 Season four was the product of ten writers, and creator Jenji Kohan got to deliver a much better return when she crafted the season finale with Tara Herrmann. Any opening episode is difficult, and the uncertain first steps of season four see it play with wide-of-the-mark comedy that plays to the gallery and characterisations that border on cartoonish. It evens achieves the impossible in making Lorna irritating, changing her into the irksome motormouth that Brook Soso used to be. (Thankfully this situation is reversed, and Lorna becomes her usual engaging, sympathetic self before the run is over). 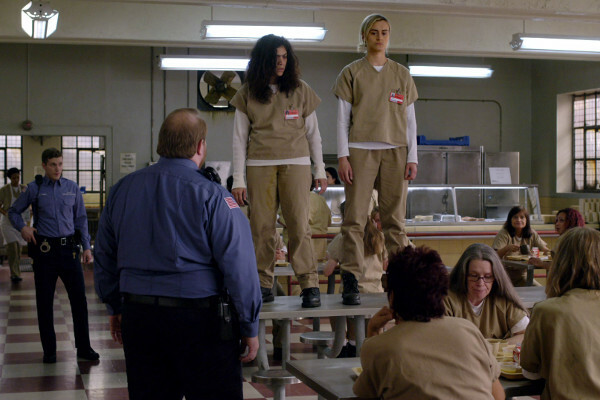 However, it's not all bad, and even weak OITNB is average television. Lolly, season three's most wasted character, finally gets consolidated as a worthwhile addition to the series, concluding season three's cliffhanger by killing the hitman who was choking Alex. The final minutes of the episode enter gory territory, as they spend time cutting up the body, burying it in the garden. One intriguing element of the series is how sadistic the new guards are, and how far they'll go to physically and psychologically torture the prisoners. It does, unfortunately, stretch credulity in places, and forces the more twisted guards from previous seasons to be retroactively lightened in order to accentuate the difference (most notably Coates), but it does make for an interesting dramatic device. This episode sees violence between the various racial groups almost spill over, which is troubling; the non-white races are frequently shown to be susceptible to violence and drug running when under the influence of a strong leadership figure (and, while the Dominican element of the season is engaging, it does share familiarity with season two's arc), whereas the white characters have to be neo Nazis before they're prepared to turn to out-and-out violence. All said, arguably the most likeable and engaging characters are the black inmates, which is somewhat refreshing. After the misfiring season three, the series shakes things up once more by bringing in new guards and new prisoners. One of the most likeable is Alison Abdullah (Amanda Stephen), whose Muslim religion clashes with Black Cindy's new-found Judaism... the comedic sparks between the two and their eventual friendship is one of the highlights of the season. On a more dramatic note, a large intake of Dominican prisoners sees a power struggle in the prison, a situation that Maria (Jessica Pimentel) takes advantage of, positioning herself as the new leader of an emerging racial faction. Pimentel had previously appeared in all but ten instalments, dating right back from the second episode of season one. However, the programme had yet to throw a real spotlight on her character, and the 2016 episodes give her chance to grow. 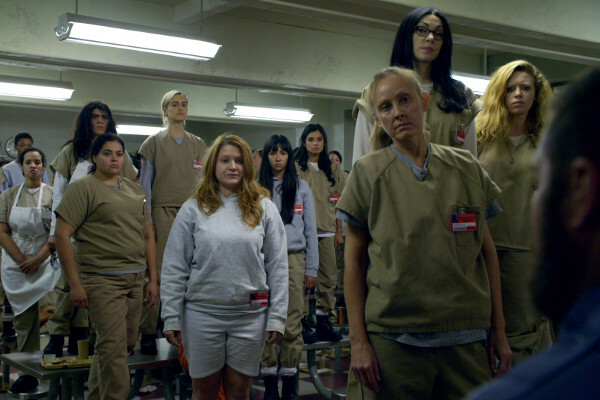 During each season, Orange Is The New Black has interesting points to make on society. Sure, sometimes these subtexts are overt, and it's not quite The Wire in terms of scope and cultural commentary, but Piper's acknowledgement that society has conditioned her to see female sexuality as currency is a strong point in an otherwise middling episode. The flashback story here concerns Blanca in her old life as a home help, a job she despises. There comes a natural point in a season where a break is needed from the drama to give viewers time to breathe, and take stock, and this is very much a marking time episode before the final dramatic push. Lastly, there is a certain metatextual quality to the programme, where characters regularly discuss television. Having a fictitious "celebrity" join the inmates with Judy King pushes perhaps too far away from strict realism, but she provides some amusing moments, and here modern TV is also debated, from Breaking Bad to The Walking Dead. There's an opening sight gag in this episode that unfortunately turned out to be far more prescient than the makers could ever have realised: the entire season was released onto Netflix on the 17th June 2016, just five days after the mass shooting at the Pulse nightclub in Orlando, Florida. 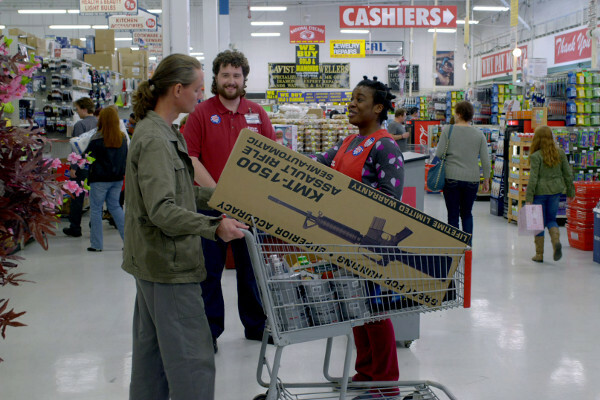 The opening flashback story with "Crazy Eyes" has her working in a store where assault rifles are easily bought by customers as if they're convenience products. Orange Is The New Black can rarely be accused of subtlety with its satirical commentaries on modern life, but they are still worthwhile inclusions. It's also a season that intentionally gets near to the mark in terms of content, with the "black lives matter" phrase referenced on multiple occasions, and a grim parallel of other race-related stories from real life headlines, which I can't discuss in more detail so as to avoid spoilers. The main focus of the episode is the discovery of the hitman's body from episode one... because he was disguised as a prison officer, the staff suspect that a guard was killed, and lock down the prison. As the new prison staff are from a military background, events almost echo the famous Stanford prison experiment, with them continuing to torture the inmates, even encouraging a fight. Although such elements take a suspension of disbelief, the final resolution of Counsellor Healy and Lolly's story does reward. That said, the series perhaps doesn't have a great reputation for its handling of mental health issues, particularly when this episode features both "Crazy Eyes" and Lolly losing their minds, and the end titles song featuring lyrics, however ironically, that include the lines "I think you're crazy, I think you're psycho." 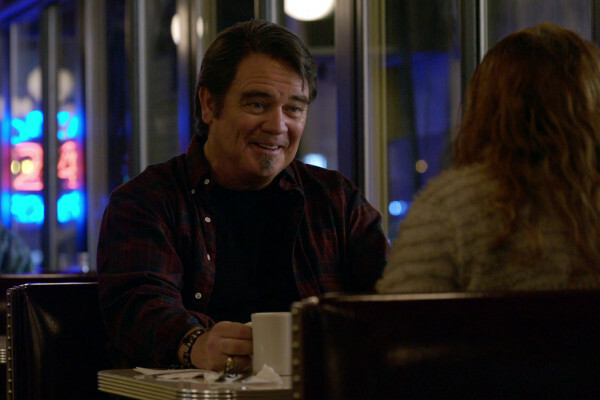 Counsellor Sam Healy (Michael Harney) is one of the more complex characters of the series, the theme of "power corrupts" that runs through season four having been his own personal arc throughout the entire show. A sensitive yet also petty man, his rejections from inmates have led him to indulge in extreme acts of cruelty, most notably turning his back on Piper when her life was under threat at the climax of season one. This episode gives another chance to understand/rehabilitate Healy, showing his younger years where he was desperate to reclaim a relationship with his mentally ill mother. The closing moments of the episode see Lolly confess to the murder, but not be believed by Healy... an event that will have huge personal consequences for them both.